My primary goal with 16-Bit Tactics is to create a system that allows players to switch jobs between adventures/battles and still meaningfully impact their advancement. Currently for 16-Bit Adventures there is no special rule for switching jobs, we just switch whenever someone wants to play something different. Since the only real decision point is to pick a job all they have to do is pick up the sheet for that job and then get assigned some gear. That method is certainly simple, but it doesn't lend itself to mixing job abilities in the way that the tactics series does, nor even how FFV does. It also can't capture the sphere-grid nor license-board methods nor subjobs, etc. In short, it's not good enough. There are two ways I've figured that will work to allow characters to switch jobs. 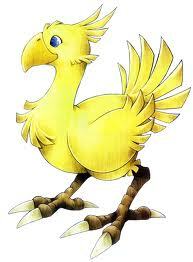 The first is the FFV method. Separate job level from character level and assign specific stats to each. This would mean that a Level 10 character would have one profile and the current job level would modify that template. The second is the FFT method and it assigns each job stats and when you gain a level you add the stats from the job you gained the level in to your own stats. There is no recalculating anything when you switch. The only thing that changes in this case is your Primary Job Ability. The second method is the one I've been working on. You have two kinds of stats, cumulative and static. Cumulative stats are the values that change with level: your HP, MP, DMG & M.DMG. Static stats are always the same and depend on your current job and active abilities. They are MOVE, JUMP, ATK, M.ATK & EVA. Gear can influence any stat, both cumulative and static. Additionally, gear determines your base DEF & M.DEF. A few job abilities can modify these but for the most part it is the items you equip that govern them. 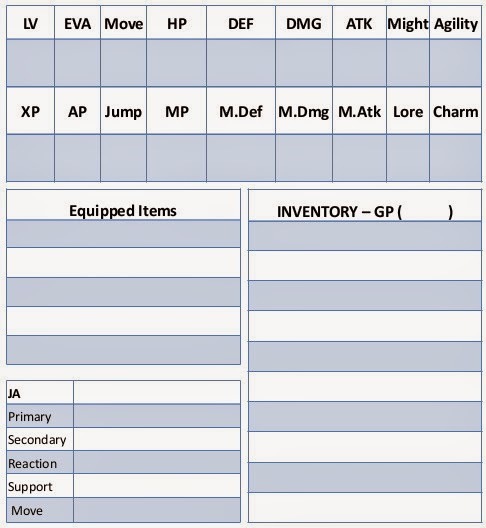 Here's a shot of the amended character sheet. The main differences are the addition of Move and Jump, that JAs are no longer a list specific to the job and that items are more customizable. You can still only equip one armor, and still only have 2 hands but you could equip 5 different types of accessory (helm, cloak, gloves, boots, rings...). Your primary JA is always determined by your current job. Fighters have Battle Tech, Monks have Kung Fu, Black Mages have Black Magic, etc. Your secondary JA can be any JA of any job you have unlocked. Reaction, Move and Support abilities must be unlocked from different jobs with AP. Once you know a particular ability you may equip it regardless of your primary job. Each primary JA is an umbrella under which all actions usable by that job are placed. If you have the JA equipped you may use any abilities governed by that JA that you have learned in any job. This is where the other new entry on the character sheet comes in. AP are ability points and you earn them the same way, and often at the same rate, as you earn XP. Unlike XP, which simply tells you what level you are, AP allows a great deal of choice. Each ability has a particular cost in AP and you may spend them freely; you do not need to buy a job's abilities in a set order though you do need to buy all of them to master that job. Your job level is the number of abilities you know from that job.